Cold borscht (borshch) or Cold beet soup is a cold variety of borscht — beetroot soup traditional to some Northern European and Slavic countries. 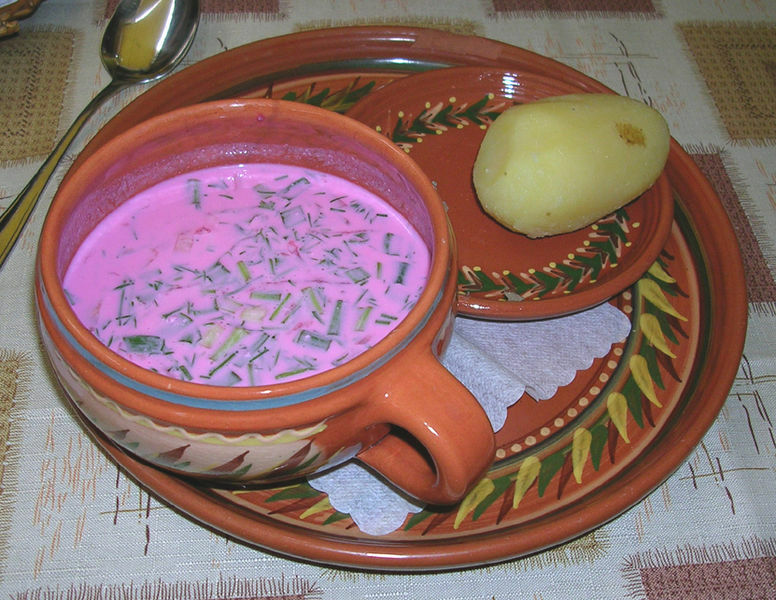 Left: In Lithuania cold borscht is often eaten with a hot boiled potato, sour cream and dill. Belarusian: Chaładnik / Хaлaднiк "khaladnik"
Its preparation starts with young beets being chopped and boiled together with their leaves. After cooling them down, the soup is usually mixed with sour cream, soured milk, kefir or yoghurt (depending on regional preferences). Typically, raw chopped vegetables such as radishes or cucumbers are added and the soup is garnished and flavored with dill or parsley. Chopped, hard-boiled eggs are often added. The soup has a rich pink color which varies in intensity depending on the ratio of beets to dairy ingredients.